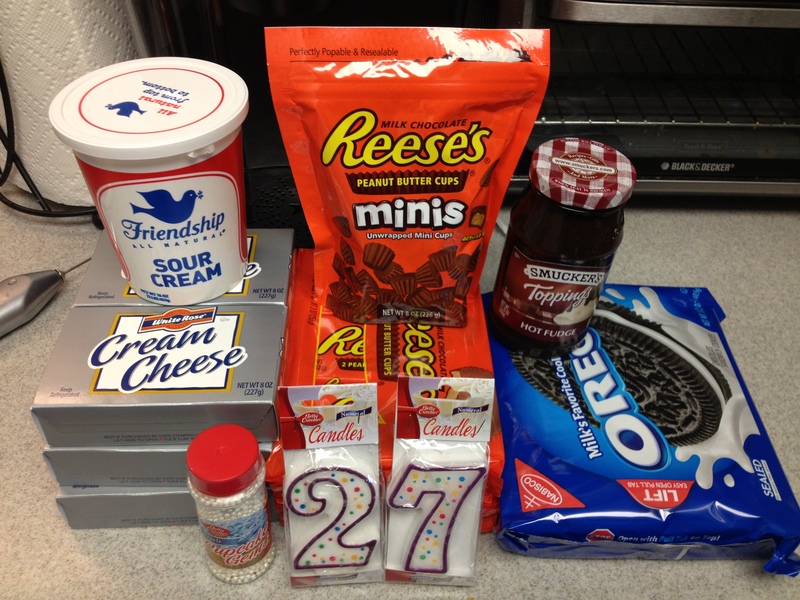 My boyfriend’s birthday celebration weekend went beyond Peanut Butter Cup Cheesecake. 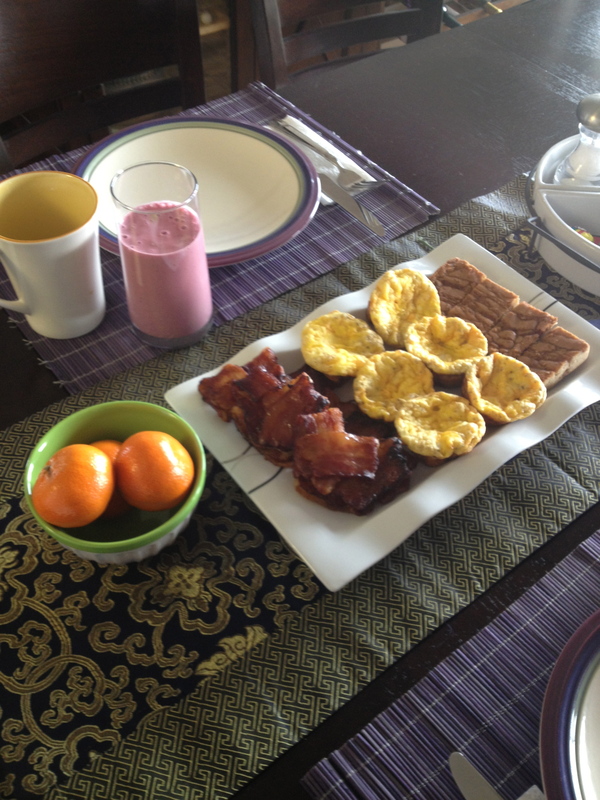 I also surprised him Saturday morning with a quick brunch for two. The whole meal took less than an hour to prepare, as it utilized a mix of from-scratch and pre-made ingredients. And all this was done as he was still snoozing away. 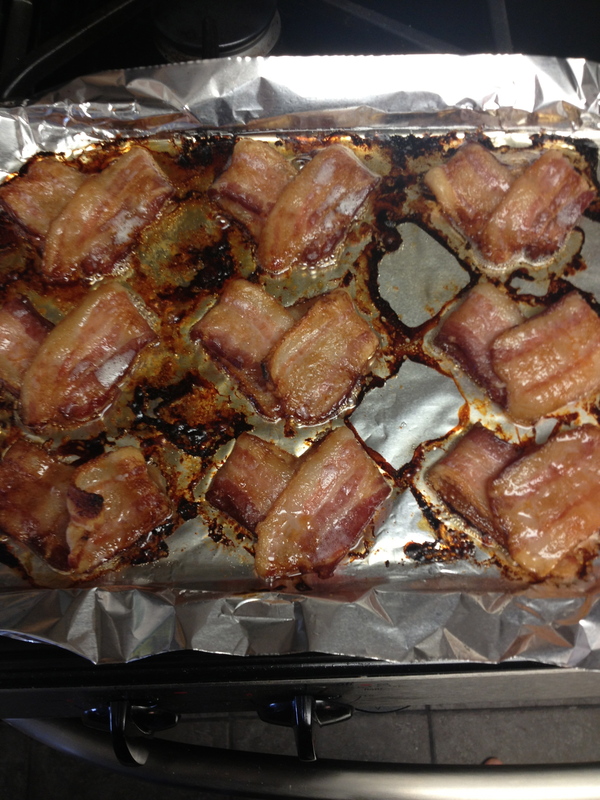 I lowered the the oven temperature to 350 degrees (it had been at 400 degrees for the bacon). I beat about four eggs and mixed in 1/2 cup shredded cheddar cheese, 1/2 teaspoon pepper, 1/4 teaspoon garlic powder, a pinch of salt, and a pinch of nutmeg. I sprayed a few molds in my muffin tin (I did not need all twelve molds), and filled each about halfway with the egg mixture. Because of how much eggs leaven when they bake, it was important not to overfill the tin, even though they eggs collapsed a bit after baking. The eggs baked for about 20 minutes, until they were just starting to turn golden and were firm in the center (use a toothpick or knife to check – if it comes out clean, the eggs are done). 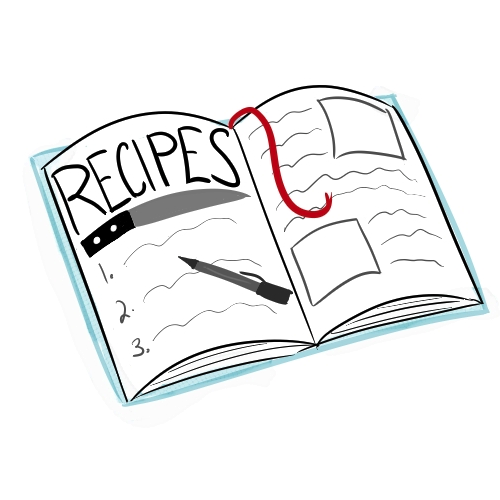 What is great about this method is that you have portion control and you can play around with ingredients in your eggs. 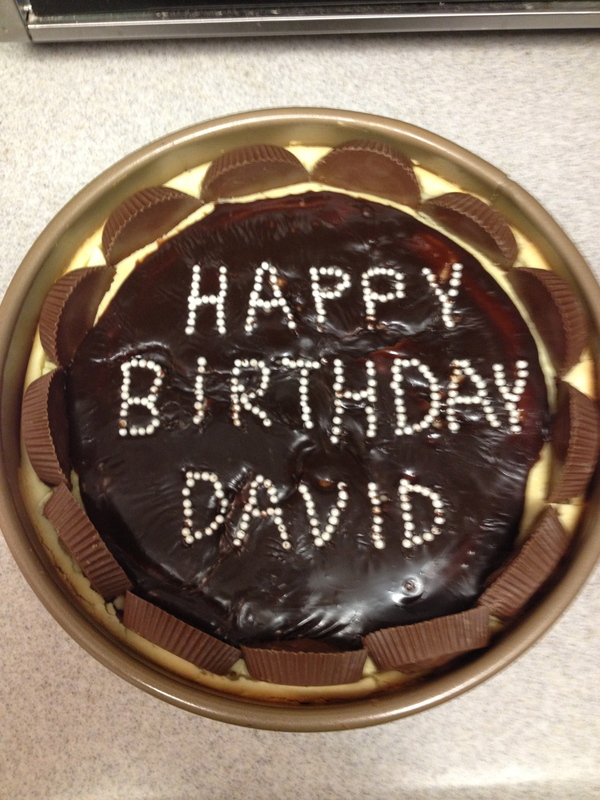 Since David’s birthday is just after Valentine’s Day, Pinterest and the blogosphere were full of cute recipes. I found this one at The Paper Mama. I did deviate from her recipe slightly, by brushing the bacon with some maple syrup and brown sugar for a hint of sweetness. I love smoothies. I have one almost every day for breakfast. 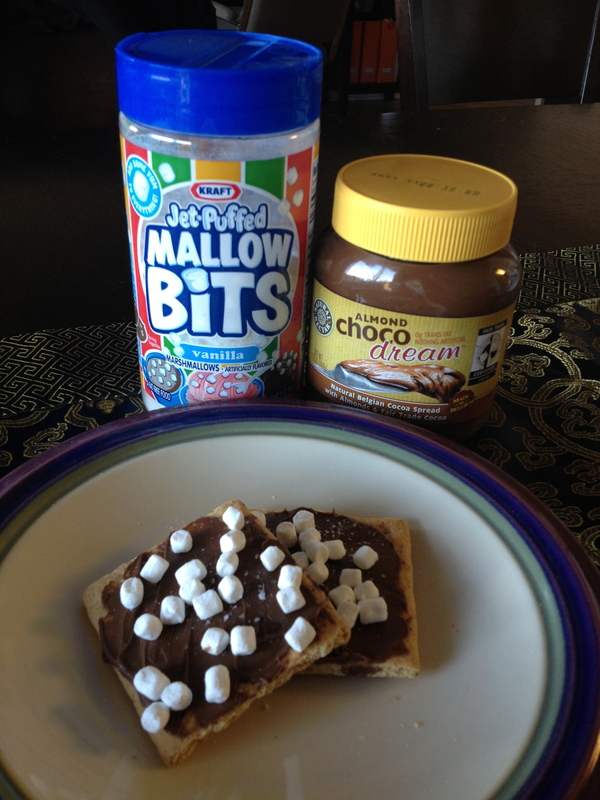 I usually mix in chia seeds and greens powder, such as Green Vibrance, but for this brunch, I kept it simple. I mixed a cup of frozen berries, a cup of frozen bananas, a cup of berry juice, in this case I used Tropicana Farmstand Pomegranate Blueberry, and a cup of unsweetened almond milk. I blended it all in my blender until smooth, about one minute. The rest of the menu was pretty much ready-made items. The blondies were Dancing Deer brand that I bought on sale at work, and I cut them in to smaller pieces, we also had clementines, and coffee was made in my Keurig. 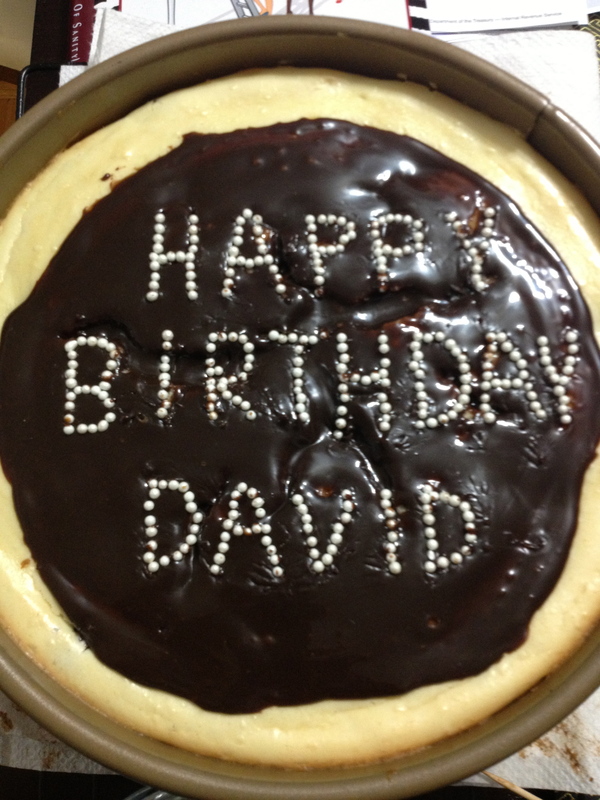 My boyfriend just celebrated his birthday this past week. Like many men, getting an answer out of him in terms of what he wanted for a birthday cake and what he wanted to do to celebrate his birthday was like pulling teeth. Through a painful text message conversation, I narrowed down that he’s not a big cake person, is anti fruit flavored cakes, not a big ice cream fan, likes cheesecake, and said that anything that combines chocolate with peanut butter is good. 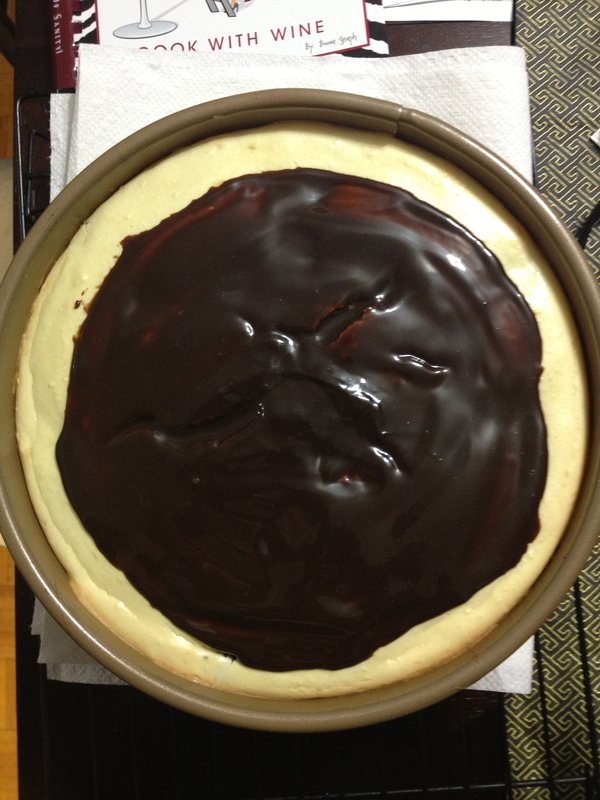 So I narrowed it down to a chocolate peanut butter cheesecake. 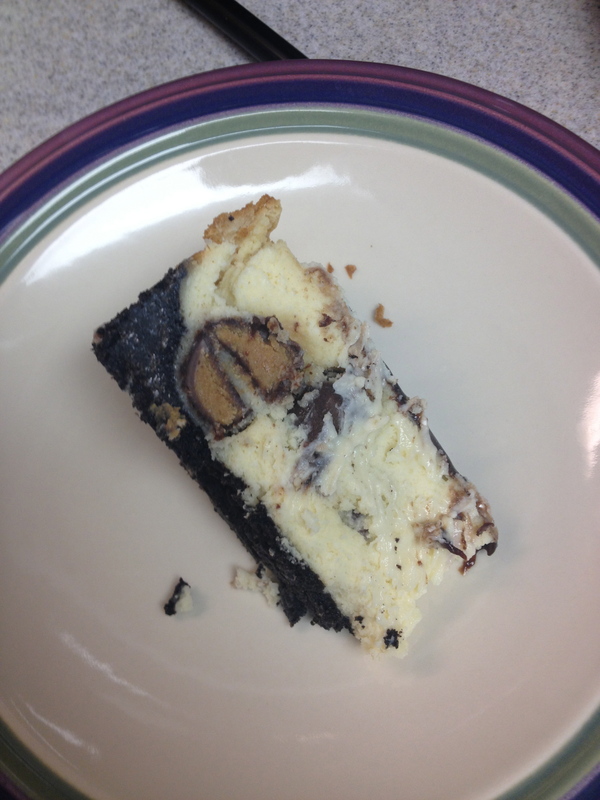 I brainstormed some ideas – peanut butter flavored cheesecake with fudge, peanut butter cheesecake with peanut butter and chocolate swirl, cheesecake with peanut butter cups, etc. 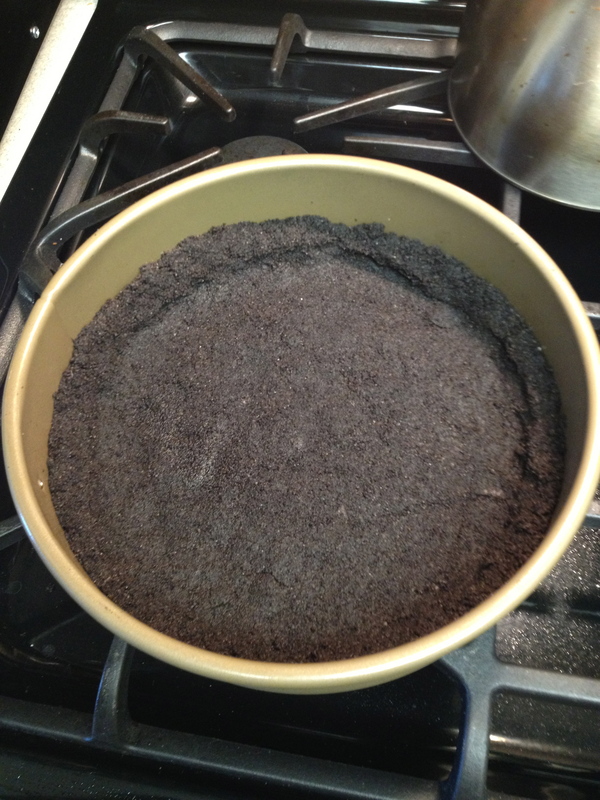 The only thing I was certain was that it would have an Oreo crust, as opposed to graham cracker or another type of cookie. In recent months, I have become a fan of the mini peanut butter cups, the ones that are a bit larger in size than an M&M. It came to me that it would be fun to fold those into cheesecake, almost like chocolate chips, and in lieu of chopping up full sized peanut butter cups. 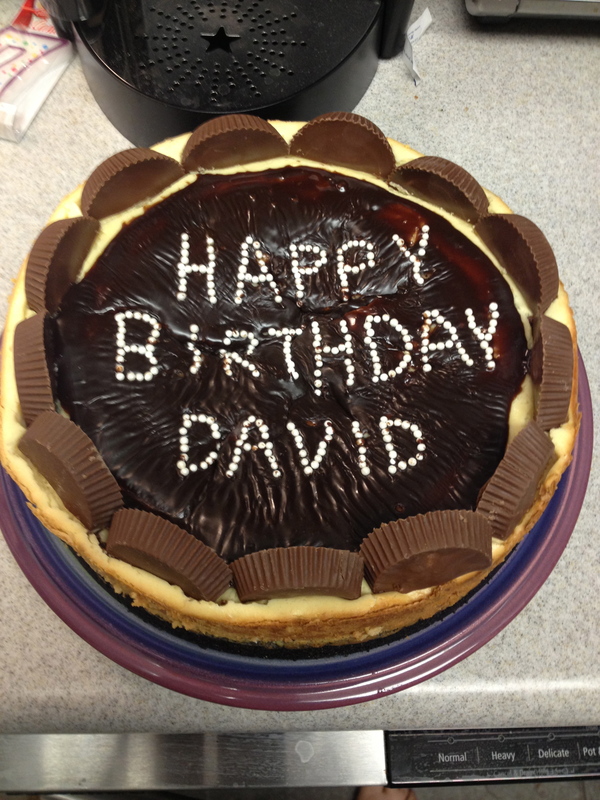 So finally I had the cake narrowed down – vanilla flavored cheesecake with an Oreo crust, mini Reese’s mixed in, the top decorated with hot fudge and full sized peanut butter cups. Since, you know, nothing says love as much as making the most fattening cake imaginable. Grease a 9-inch spring form pan with a bit of cooking spray. 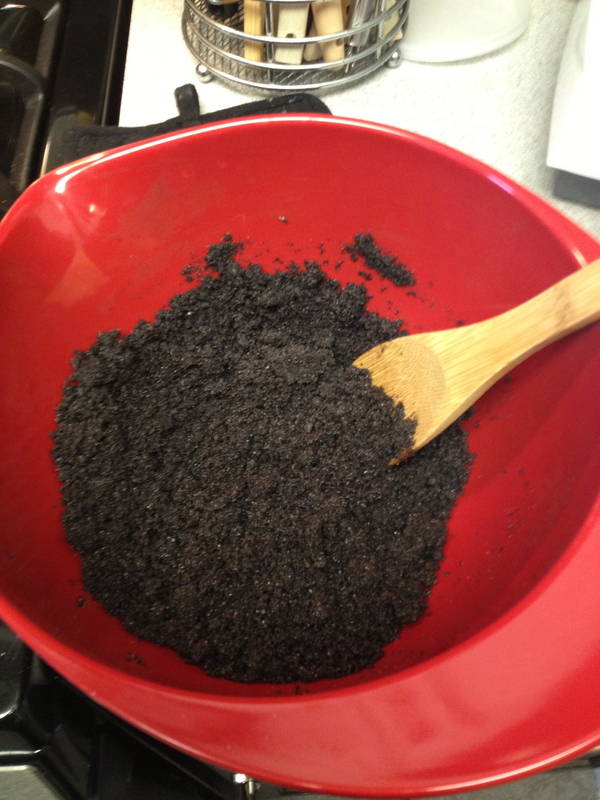 Combine crushed Oreos, melted butter and sugar until well blended. Press mixture evenly into pan, both on bottom and about halfway up the sides of the pan. Bake about 10 minutes. Remove and cool. 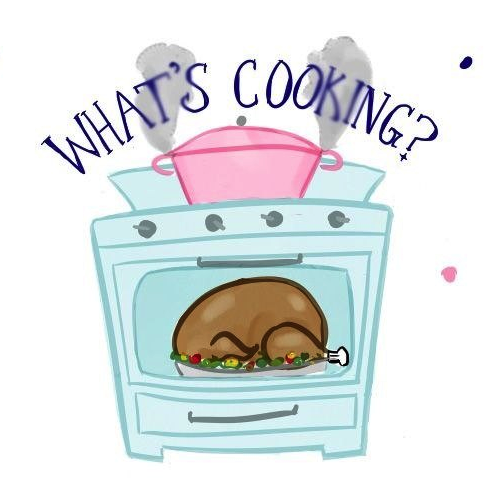 Lower oven temp to 325 degrees. 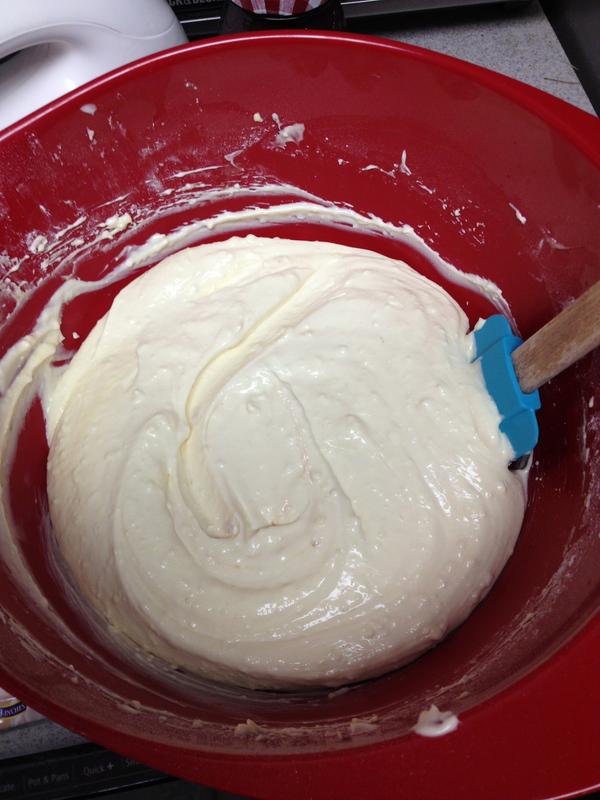 Meanwhile, using a hand mixer, mix cream cheese and sugar until well incorporated. Add eggs and mix in thoroughly. Then blend in sour cream and vanilla. Fold in mini peanut butter cups. Add filling to pan with cooled crust, and bake for about 50 minutes to one hour. Top of cheesecake will crack slightly. Cheesecake is done when you can dip a toothpick in the center and it comes out mostly clean (do not over bake – if top of cheesecake is golden brown, it is overdone). 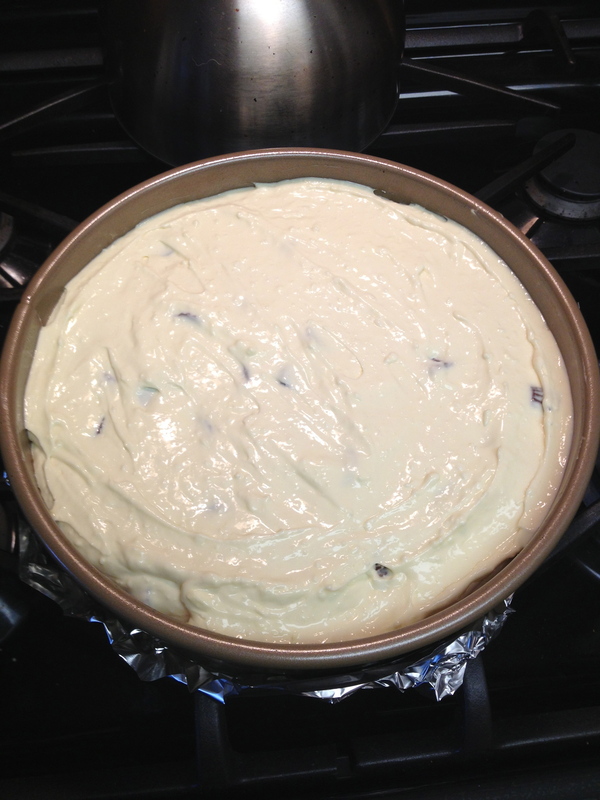 Remove cheesecake from oven and allow to cool at room temperature for one hour. 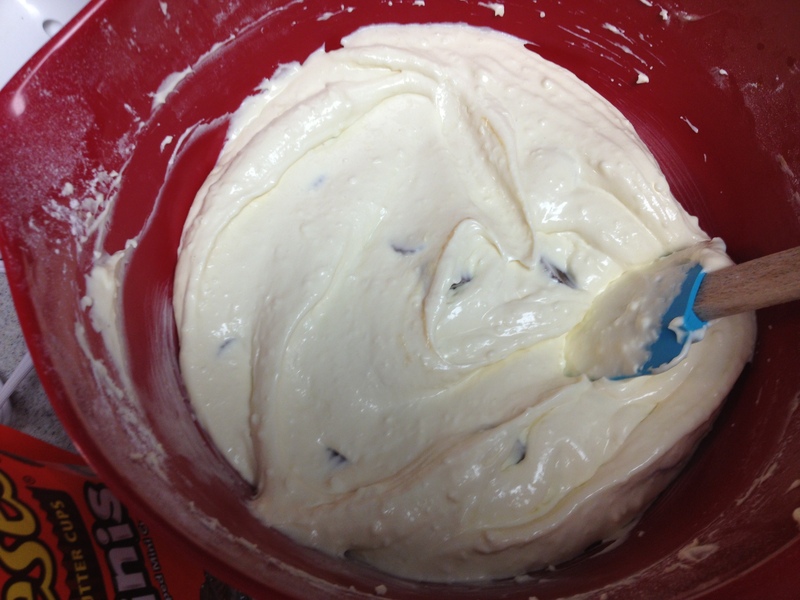 At this time, you can evenly spread the fudge in the center to decorate. 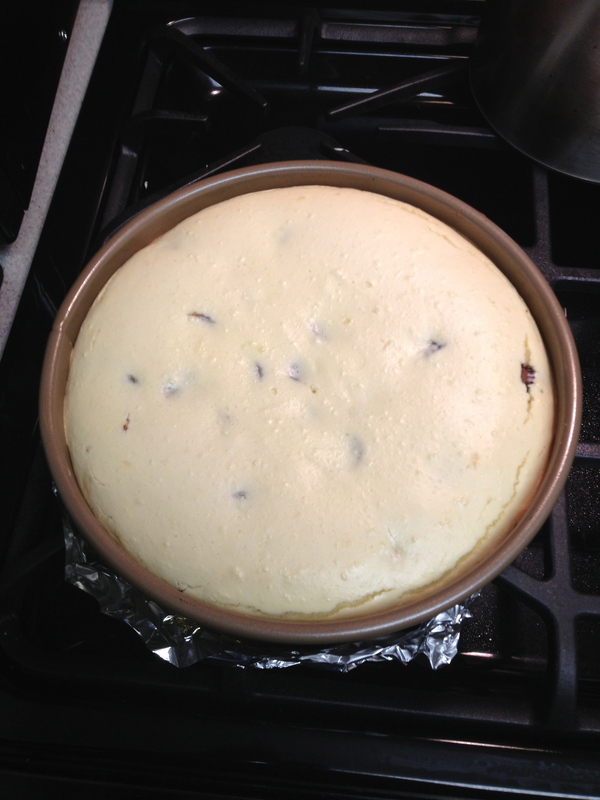 After the hour, place the cheesecake in the refrigerator and chill for a minimum of three hours, up to overnight. 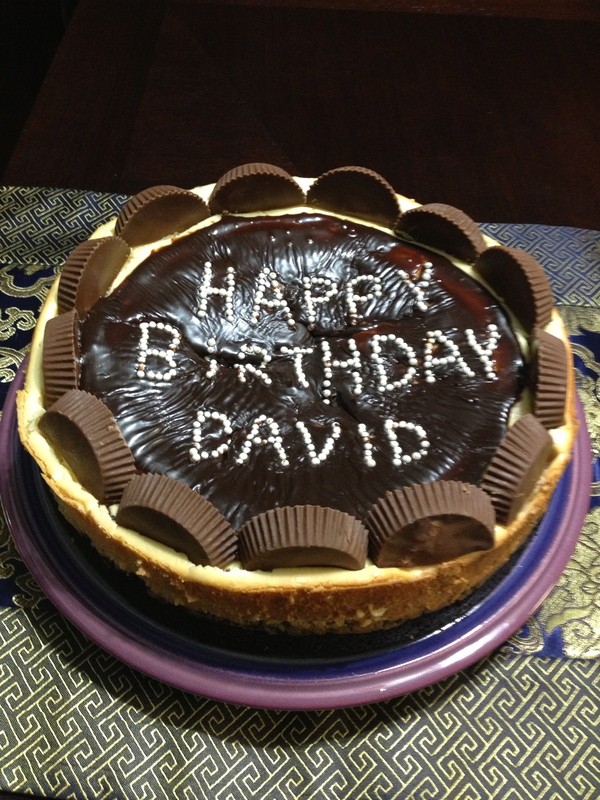 When the cheesecake is cooled, decorate with the full sized peanut butter cups. Carefully remove from spring form pan and transfer to a plate – enjoy!